Throughout October, faculty, staff and students at Susan E. Wiley Elementary School in the Copiague School District have been raising awareness and funds to benefit breast cancer. Pink ribbons were sold throughout the month and staff wore pink every Friday. Four students – Anthony Genao (fifth grade), Danilsa Espinal (fourth grade), Serenity Woods (fourth grade) and Julian Watkins (second grade, not pictured) – were recently recognized for their efforts in contributing to the fundraiser, which included donations received from an ice tea stand. 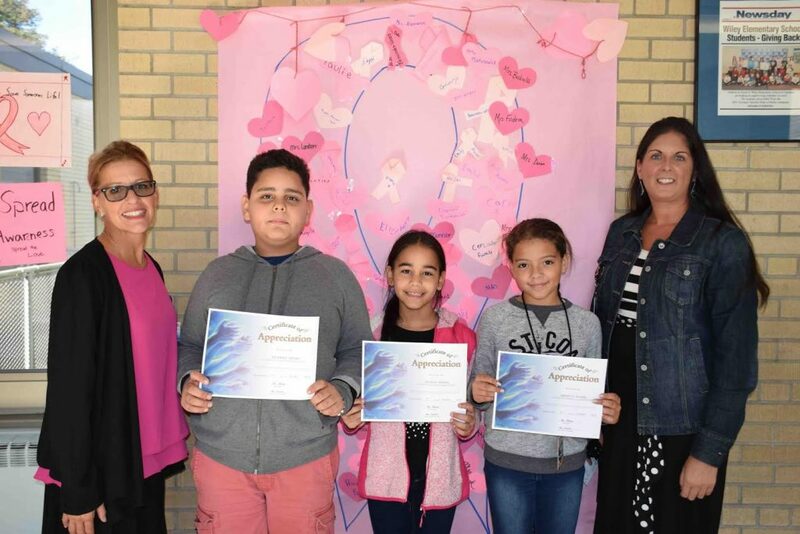 They each received certificates of appreciation from Principal Cynthia Florio (left) and Assistant Principal Janine Proulx.